The kingdom has plans to introduce capsule rooms in the western city of Mina in the coming days, as an estimated two million Muslims gather for the six-day Hajj, one of the five pillars of Islam. 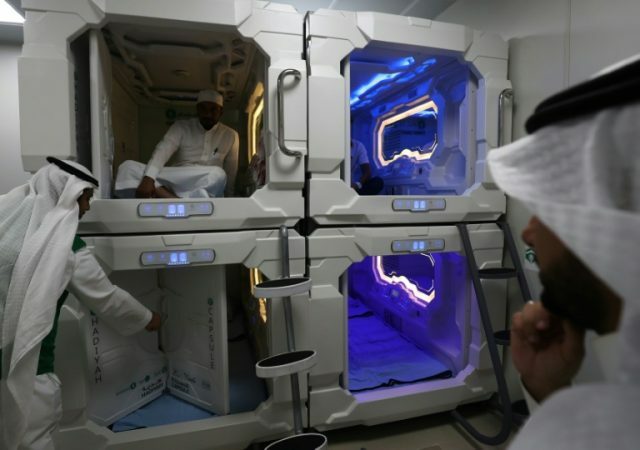 But for Hajj, which takes pilgrims across Makkah and Mina — two cities in western Saudi Arabia home to the holiest sites of Islam — the pods were also inspired by the rising popularity of car- and bike-sharing. A trial run of 12 pods earlier this year was, he said, a success. Amer estimates 60 people used each pod every day during the holy fasting month of Ramazan. Hajj presents the Saudi authorities with major logistical challenges, as Islam is currently the world’s fastest-growing religion, according to the Pew Research Centre. Saudi authorities are pushing a “smart Hajj” initiative to meet with the growing demands of hajj, which coincide with the kingdom’s unprecedented modernisation drive.